Last week Milan became the latest city to banish cars from streets to curb its horrible smog. 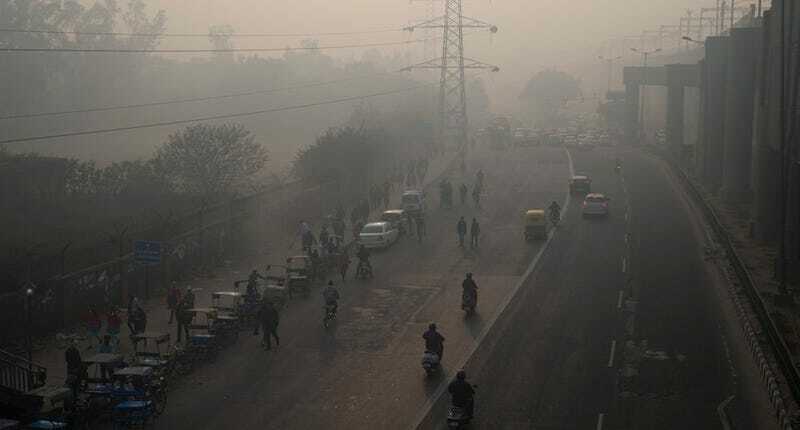 On January 1, Delhi joined the club with its own vehicle restrictions, but the challenge before the chronically polluted Indian city is much much greater. Will a every-other-day ban on cars be any help? After recording some of the worst particulate matter levels in recent memory (yes, a lot worse than Beijing), Delhi enacted a two-week pilot project that started January 1 which only allows private cars on the roads on alternate days (determined by the last digit of the license plate). Although the government has been saying the experiment is off to an “encouraging start” (of course they are), the reality is that the ban started at a time when workers were on holiday. Today, as these photos show, some commuters faced longer lines just to enter subway stations and extremely packed buses and trains (there was even a fake photo that made the rounds, showing what looked like impenetrably thick crowds). But the buses reportedly moved quicker and stayed on schedule because they weren’t stuck in traffic. But the toughest challenge facing the city is enforcing the ban, which seems like an impossible task at best. There are already plenty of exemptions: women, politicians, judges, police, prison officials, and anyone who can prove they’re sick. Plus motorbikes, which can be the dirtiest form of transportation, are not included in the restrictions. Auto rickshaws are also still allowed, and becoming the alternative transport choice for many. Today, the city’s traffic police gave out about 1,231 tickets for violations. There’s also some question about the legality of the ban, since automakers claim their new cars meet emissions standards and shouldn’t be removed from roads at all (there’s also a diesel ban in effect hurting sales of some cars). Of course carmakers will be worried since Delhi represents one of their biggest potential markets: The city adds an estimated 1,400 cars to its streets every day. The biggest problem, however, is that this isn’t a long-term fix. Schools have been canceled until January 15 so buses can be used as public transportation, for example. The city needs to seriously beef up its own infrastructure and provide better mobility options, not borrow school buses. And two weeks isn’t long enough for people to change their commuting habits. The worry from officials is what will happen if people find themselves inconvenienced in any way during this trial period. In many cities with similar car bans, wealthy residents simply get a second car that they can use to drive on the alternate day. Or they just buy fake plates.